When I was a young kid, maybe third grade, someone gave me The Aleph-Bet Story Book , by Deborah Pessin (JPS, 1946). It is a children's book with 22 chapters - each about one of the letters of the alphabet. All the letters take anthropomorphic forms and get their own story. Many of the letters are associated with the etymologies of their names: Gimel becomes friends with Gamal the camel, Dalet helps Adam invent the door, etc. Pessin has Hey invent the first window - for Hey "looked like a window". That always seemed strange to me - since hey does not look that much like a window to me. "What the he meant - and this is no kidding - was "Hey!" The letter's name indicated a shout of surprise. And the letter's shape illustrated it strikingly. The earliest surviving example of a written he appears oldest known alphabetic writing, carved into limestone in Central Egypt around 1800 BCE. The letter shape is a human stick figure, half crouching, perhaps leaping upward, arms raised at the elbows. The person is probably meant to be shouting, in an ancient Semitic expression that by coincidence resembles our "Hey!". " You can see the development from the "hands-up" guy here to our current hey on the e-hebrew site. There are those that say that hey actually refers to the Hebrew word הלל - hillul or hallel, meaning jubilation. I'm not so sure. While hey does start the word hallel, it isn't actually the make up of the word. In any case, I'm not sure we need to look so far. In Hebrew and Aramaic the words הא and הי (hey and ha) mean "behold". Klein says that הי, meaning "lo", "behold" or "here is" works as a prefix in the words הילך, היכן and הינו. Interestingly, to return to Pessin, there are those that say that while the character originally meant hillul, it followed a similar transformation as we've seen in other letters, and later took on the meaning - and pronunciation - of "window". I don't think that this is referring to chalon חלון, since there isn't much of a similarity. Perhaps there was a Phoenician word hey meaning window. Anybody know? I'm a native English speaker, but live in Israel and love the Hebrew language. On this site I investigate Hebrew - Biblical, Talmudic, Medieval and Modern - including slang; related languages like Aramaic, Arabic, Akkadian and Yiddish; and how foreign languages like Greek, Latin and English have entered Hebrew - and how Hebrew has affected those languages as well. I discuss the meanings of words, with a focus on etymology. Please feel free to leave a note in the comments or send me an email. I can't promise to reply to every email, but your questions might lead to a future post! Support Balashon through Amazon purchases and searches! 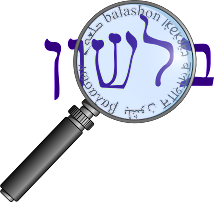 See the latest catalog of The Academy of the Hebrew Language!